Intelligence Minister Yisrael Katz (Likud) said Friday morning that the incitement propagated by the Palestinian Authority is what leads to terrorist attacks such as the the deadly stabbing attack in the town of Adam last night. "It's interesting that this terrorist came from the same village from which the terrorist who massacred the Salomon family came. This is proof of the inspiration and the atmosphere. It is enough to see Abu Mazen (Mahmoud Abbas), who also claims that he will pay the last shekel he has as an incentive to the families of the terrorists, to understand the picture in the region. This is the time to implement the law that determines the cessation of funding and the transfer of a budget exactly equal to amount that Abu Mazen funds the families of the terrorists," Minister Katz said in an interview with Nissim Mishal on Radio 103FM. 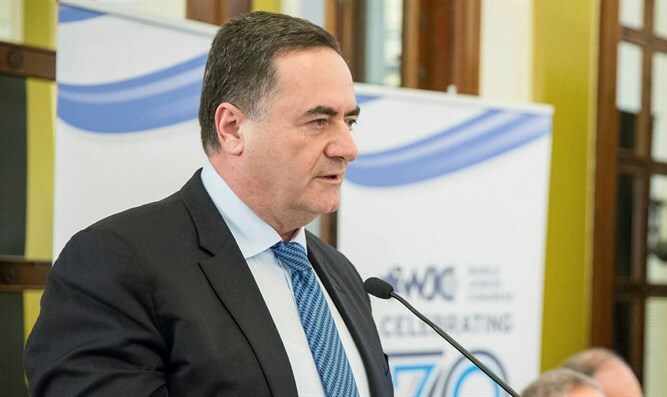 Katz mentioned his initiative to pass a law calling for the expulsion of families of terrorists to Gaza: "I am no longer talking about punishment. It is a means of deterrence beyond the demolition of a house whose purpose is to save lives. I called on the prime minister to allow the advancement of the law, because Hamas encourages such terrorism and they receive support and incentives from Abu Mazen." He also addressed the security situation in the south and harshly criticized the defense minister. "Israel has no clear policy vis-à-vis Gaza, and there are two options for dealing with the situation in Gaza: complete civil disengagement, or creating a plan for Hamas to decide. The policy Liberman supports is to keep Hamas' head above water, and that is a failed policy. It is an impossible and incorrect policy." "In the Hamas decision, there are military elements that I will not discuss. I always suggest separating from Gaza, but I am being prevented from making a final decision on this proposal, and I have been proposing for years to separate from Gaza and to create a border, like Lebanon and Syria, It is absurd. How can it be that with Nasrallah, who heads an army of 150,000 rockets in Lebanon, we have succeeded in creating a deterrent force, but in Gaza, where there are enormous power gaps, Hamas leaders [are not dettered] from harming the IDF soldiers. Something is wrong with Israel's policy, and it does not allow itself to express its full power," added Minister Katz. According to Katz, the problem is the lack of a consistent policy vis-à-vis Hamas in Gaza. "The defense minister still thinks Hamas should be made to decide on a proposal, in my opinion, if the peace is not restored, we are very close to another battle in Gaza. It is important to understand that I am not pushing for war. We want to supply fuel, electricity, concrete, cement, or water to Gaza, as the security establishment is doing today. As far as I'm concerned, this is not a normal situation, and it is impossible to leave the residents of the State of Israel in the situation they are in."